Twenty minutes North of Columbus. I-71 Exit 131. Close to world-famous Columbus Zoo, Ohio State University, Muirfield & next to Alum Creek Marina. 120 restaurants & Polaris Fashion Place 10 minutes away. Meet me at the Creek! An OK park, my mistake was not being careful when booking and ended up with only power and water. Not a great deal as the only place to dump my gray and black water was at the main entrance and had to jockey my RV to get to the dump site. They claim to have an agility area for dogs, but that was taken over by their Halloween display. I was looking forward to spending a week almost “unplugged” with my family. This place has all kinds of things for kids to do. I couldn’t wait to let my kids play and not have there noses stuck in an electronic! What a slap in the face that was once we arrived and got settled in. The younger boys 8 and 14 wanted to get in the pool (it’s 94). So as soon as we had the camper parked we got dressed and went to the pool. The boys are having a great time until a man walks over and says they are not allowed in the pool if he’s not at the pool. (I had no clue who he was) Come to find out he was the “lifeguard”. They have no signs about having a lifeguard on duty and nothing in the “rules” about a lifeguard. It states that children under 12 must be with an adult. This “lifeguard” takes brakes every 30min to an hour, and is gone for about 30min. He doesn’t pay attention to the kids/people in the pool, just keeps checking his phone for his next “break”. 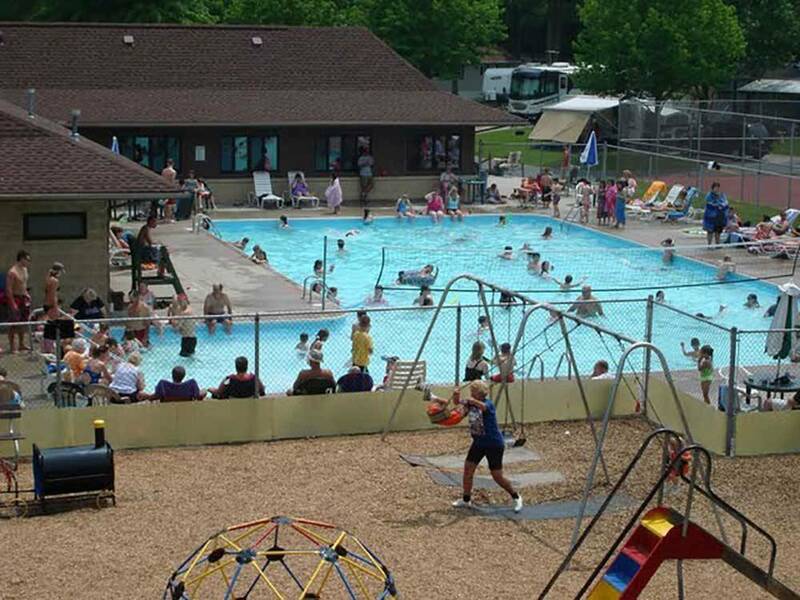 The pool is open 12-8 during the week. This was a let down for my children and myself. So I figured we would find something else to do. My oldest son (17) wanted to play Bocce Ball, went to the office to get the things needed, and they didn’t have the balls for the game. So we settled on shuffle board. The youngest doesn’t want to play and wants to go to the park. Now I can see him from the shuffle board area, and also from out camper. We are parked right by everything, but because he isn’t 12 he is stuck with us adults. If you are planning on staying here be prepared to have to sit on top of your children under 12 as they can not be out of your site. Hopefully things will get better as the week goes on. As for now I would rather be back in the state park. The staff was super nice. We tent camped and they were nice enough to get us a site big enough for a 15 person tent. The restrooms are very clean!! The amenities are great for kids and adults!! We would definitely stay again!’ The only sad thing was we couldn’t swim because the pool was ice cold, it would be nice if they heated it until mid to late June. I think the staff really went over and above for us. Thanks for the great time!! We stayed here all winter. This is a good campground. We will stay again. They are the most generous, welcoming and authentic people at Cross Creek. The showers are clean and always hot. The facilities are A+ and the grounds are impeccable. I absolutely Love it here. This park was a 10 10 10 as the rating said, paved roads and level sites. Clean park and family frendly staff. The park is deserving of the Good Sam rating! The site was level, there was a nice patio with a nice /useable table. There are nice walking trails in "the woods" between the park and the lake. The dog run was amazing. :) The on site store was well stocked. The park was very clean and friendly. (wifi sketchy - but it seems that is the way of things almost everywhere) We would definitely stay there again. This was our first time out with our RV and this was definitely a good place to spend it. The sites were all well kept and the facilities and restrooms were always clean. Definitely will be going back. Pretty, well maintained campground. We arrived after 7 and another guest showed us where our paperwork was - check in and finding our site was easy. No cable as others have said, wifi didn't connect and they do give you a paper suggesting that if you do use their wifi you contribute $3.00 a day. People at this camp were friendly and employees were efficient and helpful. Didn't use their restrooms so can't comment on them. We've stayed at campgrounds that were truly 10/10/10 and while nice, we didn't see this as quite up to that very high standard. 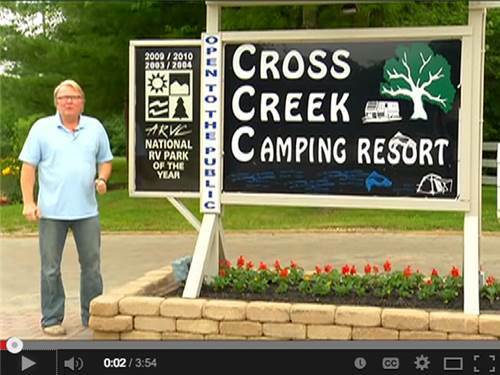 We recently completed our second stay with the folks at Cross Creek and loved it. The facility is clean and very well maintained. Lots of mature trees and even a hiking trail. Both stays, the sites have been spacious and in proper working order. Oh, and most sites have their own concrete or paver patios! The staff has always been very polite and helpful. The community and employees all engage in special activities and events for the entire park (cookouts, OSU games, pumpkin painting, a haunted house, Christmas in July, etc.). The pool is fantastic and they even have a miniature mine sluice that you can buy a bag of minerals/dirt for the kids to do. The addition of cable to the sites would be nice but is hardly a deal breaker. We camp often due to sports for the kids and really have enjoyed our experiences with Cross Creek! Can't wait to go back and see them again in early November. Friendly atmosphere and a helpful staff. Even though we only spent the night, we promised ourselves that we would return to this park. This is one park where I agree with the Good Sam rating. This is a real nice park with over-the-top customer service. Nice large site, good utilities, but typical slow wifi. Some permanent sites but they must make them keep the sites nice as many were landscaped nicely and didn't have all the stuff that you sometimes see. Park is quiet too. This was our second time at this resort. The first time was off season and mostly empty. Everything was wonderful. So we gave it a try again on the first beautiful weekend of the year to get the real picture. We loved it. It was very busy but everyone was friendly and the park itself was full of amenities and extremely clean facility again. Will continue to go on a regular basis. Very clean and well kept up with all of campgrounds. This is our favorite campground in Ohio. Park was nice, but couple things were not a 10,10,10 as I would have thought, water pressure very low, also no cable, and no wifi at my site or any site that I walked around too. None of these things would make me not go back, just not as advertised in my option. Relax in Central Ohio's Premier RV Resort! Stay at our Award Winning Campground and enjoy great boating at nearby Alum Creek State Park & Marina! Bring your own boat, or rent one at their marina. After a fun day on the water, relax around a cozy campfire!